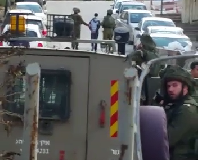 Last night at midnight Israeli troops again entered the village of Awarta, south of Nablus, arresting a large number – estimated to be around 40 – men and boys. According to the village Council they were taken to Huwwara military base where they were questioned, finger-printed, photographed and had their DNA taken. 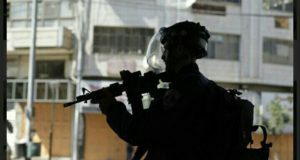 A number of villagers are still imprisoned in prisons around the West Bank and Israel and have been held for over two weeks, whilst others who have been released have reported serious mistreatment from the army whilst being held. 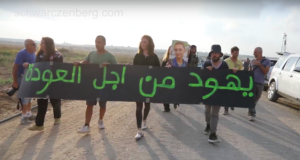 Since the killings in the nearby illegal settlement of Itamar on 11th March, the army has entered the village of Awarta every night and has subjected the villagers to military curfews, one of which lasted five days. During this time villagers were not permitted to leave their homes and many houses were left without food, water and gas. Ambulances were also prevented from entering the village in direct contravention of article 56 of the Geneva Conventions. The army has also repeatedly searched the houses in the village, destroying property, assaulting families and taking money, jewellery and computers. This collective punishment continues despite the fact that no evidence has been published which confirms that the killer is a Palestinian. The settlers of Itamar responded to the murders by attacking surrounding villages and erecting new housing structures on the outskirts of Awarta.